Winter can be a very hard time of year for birds struggling to find food but the good news is you can help them out without having to resort to expensive shop bought bird food or bird feeders in your garden. Birdseed bombs are a cheap and easy way to help out the birds using items which you most likely already have in your kitchen cupboards. And the best thing is you get to watch all the beautiful colourful birds feasting on the food in your garden. So what exactly is a birdseed bomb? It’s a ball of fat packed full of bird seed, fruits and nuts which you can hang in a tree, or leave out on a bird table, which will give birds all the nutrients and food they need to see them through the winter. Our friends from Little Peckers gave us the basics of birdseed bombs and how you can make them. You can use any number of ingredients but to make a basic birdseed bomb try chopping up apples and pears into very small chunks. You will then need some wild birdseed and for the fat you can choose lard, suet or even peanut butter. Then you just need some biodegradable string or a long wooden tooth pick to hang it from. You can skewer the fruit and then warm up the fat, mix with seeds and pour the warmed up fat over the fruit, or simply warm the fat, mix all the ingredients together and form into balls which you can then skewer. Then you can hang the seed bombs by the twine onto trees with lots of branches so that birds can land and perch. You can even throw them on the floor for birds to find, or leave them on your bird table or in bowls on the ground and they will be found. What else can you use for bird feeding balls? For bird feeding balls you can also use cheese or dry porridge oats mixed with melted fat and if they are too soggy you can set them in the fridge before hanging them out in the garden so they are nice and solid for the birds. You can also try making your birdseed bombs with currants, oats, sultanas, peanuts, grated cheese or crumbs from bread or cake. You should aim for one part fat to two parts dry and mix it all together in a bowl. Don’t use turkey fat for the birdseed bombs, firstly because it doesn’t set like suet and lard do which makes it harder to hang the bombs and also because it can cover the birds’ feathers which makes it hard for them to fly. I don’t want to use skewers, how else can I hang them? Another way to hang the bombs is to use old yogurt pots – make a hole in the bottom to pass your string through, then fill the pot with the warm mixture. Put it in the fridge to set and the next day cut the yogurt pot off. You can then tie a knot in the end of the string and hang the bomb directly in a tree. Can I freeze birdseed bombs? You can also make a batch and freeze them if need be so you always have some on hand ready to hang out for the birds. It’s important to note that these should only be used in the winter for feeding birds. Can birdseed bombs be used all year round? 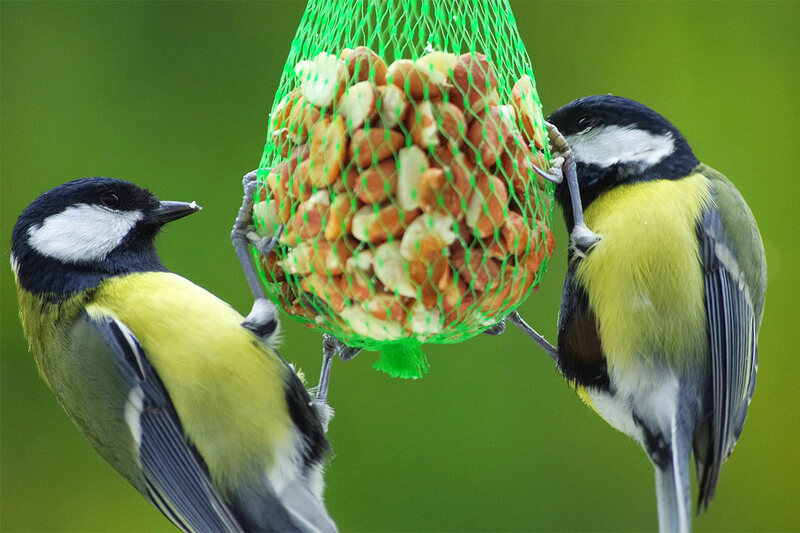 Birdseed bombs are only for feeding birds in the winter when food is scarce. It’s really important that you don’t use this type of birdseed bomb in the summer because the warm weather will melt the fat and this could then get caught in the birds’ feathers, preventing them from being able to fly and causing all kinds of problems. Birdseed bombs are very easy to make whether you opt to create them using the fruit skewer method or prefer to create them in yogurt pots first – the key is to pack the bomb full of nutritious food for the birds to find. You can choose from a whole variety of foods which they will love and then hang them in the trees and watch the birds flock in. These type of food bombs can also attract in other animals including squirrels and potentially deer as well if they can access your garden so just be aware that you might start seeing all kinds of wildlife visiting your garden. If you want to keep them just for the birds then you will need to hang them in a way that birds can still access but other animals won’t be able to reach – but don’t hide them too well or the birds won’t find them either.